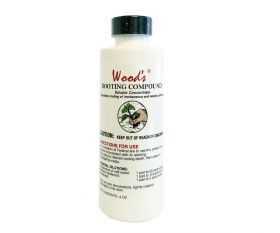 Because it contains isopropyl alcohol, Wood'sÂ® Rooting Compound is self-sanitizing, eliminating cross-contamination. There are several advantages to using concentrated liquid dips over powders and gels, foremost being the flexibility to allow the propagator to easily select the exact concentration desired for each type of cutting. Wood'sÂ® is safe to use on ornamental trees and fruit trees that have not yet produced fruit. The active ingredient, IBA, is considered a biochemical pesticide by 40 CFR 180. Inclusion in this category means that it has a nontoxic mode of action because it a) is used in low volumes, b) is target-specific (only used on the tip of the cutting), and c) duplicates a naturally occurring process in plants. Wood'sÂ® Rooting Compound is currently registered with the Federal Environmental Protection Agency (reg. #43905-1) and has complied with all EPA regulations for the continued use of IBA in the product. The shelf life in the original container is up to two years (at room temperature - do not refrigerate). Limiting exposure to sunlight and intense heat will help prolong the shelf life. Wood'sÂ® Rooting Compound has a tendency to darken over time without losing its effectiveness. Once diluted in water, it should be used within a 10-12 hour period. To avoid contamination of the product, never return the mixture to the concentrate, and never dip cuttings in the original bottle. Wood's Rooting Compound has been tested extensively for both rooting effectiveness and safety to humans, animals and our environment.